While a great panel of notable European poker pros have flyed to the United States to participate in the 46th annual World Series of Poker held at Rio All-Suite Hotel & Casino in Las Vegas, numbers of enthusiasts move but without crossing a border. They actually play locally-run tournaments such as the German Poker Tour which recently took place in Spielbanks poker room, in Duisburg. It was the 7th stop of the German Poker Tour after that held in Aachen in June. 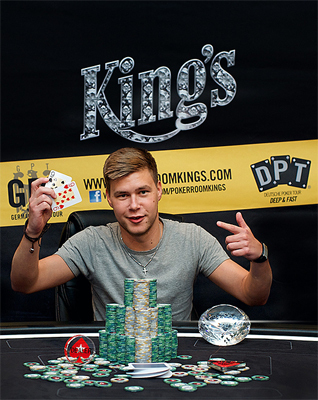 Eight (8) poker enthusiasts made it big by paying the direct Main Event buy-in of  330. Any way, the event recorded 20 entries, 4 of whom made the money for a minimum gain of  500. It was Dirk Milarch who emerged victorious by beating Pierre Sibione in the heads-up. Prematurely eliminated, shortstacks Johannes S. and Vladimir T were sent to the rail from the first level of play. The days chip leader Tareq kept grabbing as many chips after eliminating the only woman in the hunt for the title, Yvonne F. As for Thomas B, he chased Reinhold D out and saw himself making it through the final table against Dirk Milarch, Tareq and Pierre Sibione. The four remaining players would agree on a deal that would see everyone earning part of the prize pool at the end of the battle. Tareq was the first player to leave the table. He cashed  500. Thomas B fell to 3rd-place. His pretty modest finish allowed him to grab a prize of  1,150. For the heads-up finalists Pierre Sibione and Dirk Milarch, the eventual winner was guaranteed to pocket  2,000, and  1,250 for the runner-up. Apart from the top payday, Dirk Milarch was awarded a  1,100 package to the GPT Spielbank Berlin to be held in December.